In this document, we discuss various "advanced topics" for further reduction of the 3C 391 continuum data. This tutorial assumes that the reader already has some familiarity with basic continuum data reduction, such as should have been obtained Continuum Data Reduction Tutorial on the first day of the NRAO Synthesis Imaging Workshop data reduction tutorials. 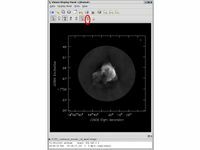 If one did not participate in the EVLA Continuum Data Reduction Tutorial, one could use the script extractor to generate a CASA reduction script and process the data to form an initial image. Current experience on a standard desktop computer suggests that such a data set could be processed in 30 min. or less. This topic is perhaps not "advanced," but it appears to fit more naturally here. It is assumed that an image 3c391_ctm_spw0_IQUV.image, resulting from the Continuum Data Reduction Tutorial exists. The other two statistics require slightly more care. The flux density of a source is determined by integrating its brightness or intensity over some solid angle, i.e., , where is the intensity (measured in units of Jy/beam), is the solid angle of the source (e.g., number of synthesized beams), and is the flux density (measured in units of Jy). In general, if the noise is well-behaved in one's image, when averaged over a reasonable solid angle, the noise contribution should approach 0 Jy. If that is the case, then the flux density of the source is also reported by imstat. However, there are many cases for which a noise contribution of 0 Jy may not be a safe assumption. If one's source is in a complicated region (e.g., a star formation region, the Galactic center, near the edge of a galaxy), a better estimate of the source's flux density will be obtained by limiting carefully the solid angle over which the integration is performed. Open viewer and use it to display an image, such as 3c391_ctm_spw0_IQUV.image. One can choose the function assigned to each mouse button; assign 'polygon region' to a desired mouse button (e.g., right button) by selecting the icon shown in the figure to the right with the desired mouse button. 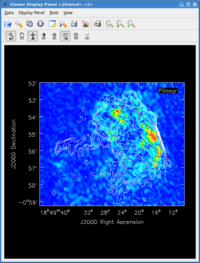 Using the mouse button just assigned to 'polygon region', outline the supernova remnant. Double click inside of that region, and the statistics will be reported. This will include the flux density value within the region selected. By contrast, for the rms noise level, one wants to exclude the source's emission to the extent possible, as the source's emission will bias the estimated noise level high. One can repeat the procedure above, defining a polygonal region, then double clicking inside it, to determine the statistics. In the previous data reduction tutorial, a full polarization imaging cube of 3C 391 was constructed. This cube has 3 dimensions, the standard two angular dimensions (right ascension, declination) and a third dimension containing the polarization information. Considering the image cube as a matrix, , the and axis describe the sky brightness or intensity for the given axis. If one opens the viewer and loads the 3C 391 continuum image, the default view contains an "animator" or pane with movie controls. One can step through the polarization axis, displaying the images for the different polarizations. 1. Extract the I, Q, U, V planes from the full Stokes image cube, forming separate images for each Stokes parameter. To correct for bias (the P image does not obey Gaussian statistics), we must supply the noise level in the Stokes Q and U images (these should be similar), using the sigma parameter. These noise levels can be estimated as described in the Image Analysis and Manipulation section above. 3. If desired, combine the Q and U images using the mode='pola' option of immath to form the polarization position angle image. Because the polarization position angle is derived from the tangent function, the order in which the Q and U images are specified is important. 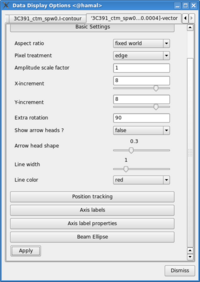 To avoid displaying the position angle of noise, we can set a threshold intensity of the linear polarization for above which we wish to calculate the polarization angle, using the polithresh parameter. An appropriate level here might be the level of 0.4 mJy/beam. 4. If desired, form the fractional linear polarization image, defined as P/I. Since the total intensity image can (and hopefully does) approach zero in regions free of source emission, dividing by the total intensity can produce very high pixel values in these regions. We therefore wish to restrict our fractional polarization image to regions containing real emission, which we do by setting a threshold in the total intensity image, which in this case corresponds to three times the noise level. The computation of the polarized intensity is specified by expr='sqrt((IM1^2+IM2^2)/IM0[IM0>2.7e-3]^2)' , with the expression in square brackets setting the threshold in IM0 (the total intensity image). Note that IM0, IM1 and IM2 correspond to the three files listed in the imagename array, in that order. The order in which the different images are specified is therefore critical once again. 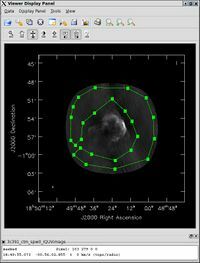 Next, load the total intensity image as a contour image. In the viewer panel, hit the "Open" icon (the leftmost button in the top row of icons in the viewer). This will bring up a 'Load Data' GUI showing all images and MS in the current directory. Select the total intensity image (3c391_ctm_spw0.I) and click the 'Contour Map' button on the right hand side. While we set the polithresh parameter when we created the position angle (X) image, a digression here is instructive in the use of LEL Expressions. Had we not set this parameter, the position angle would have been derived for all pixels within the full IQUV image cube. There is only polarized emission from a limited subset of pixels within this image. Therefore, to avoid plotting vectors corresponding to the position angle of pure noise, we would now wish to select only the regions where the polarized intensity is brighter than some threshold value. To do this, we would use a LEL (Lattice Expression Language) Expression in the 'Load Data' GUI. For our chosen threshold of 0.4 mJy (the 5 sigma level in the P image), we would paste the expression '3c391_ctm_spw0.X'['3c391_ctm_spw0.P'>0.0004] into the LEL Expression box in the GUI, and click the 'Vector Map' button. This would load the vectors only for regions where mJy. Note that CASA release 3.3.0 is missing the LEL option in the viewer. Therefore, to do the above, open a new terminal, cd to where the images are located, and start the test version of the CASA viewer by typing casaviewer-test. In the viewer, click on Data, and load the image 3c391_ctm_spw0.P as a raster image, load the 3c391_ctm_spw0.I as a contour map, and then paste '3c391_ctm_spw0.X'['3c391_ctm_spw0.P'>0.0004] in the LEL expression box of the Load Data GUI. While we now have all three images loaded into the viewer (the polarized intensity (3c391_ctm_spw0.P) in color, the total intensity (3c391_ctm_spw0.I) as a contour map, and the polarization position angle (3c391_ctm_spw0.X) as a vector map), we still wish to optimize the display for ease of interpretation. Change the image transfer function. Hold down the middle mouse button and move the mouse until the color scale is optimized for the display of the polarized intensity. Change the contour levels. Click the wrench icon to open a 'Data Display Options' GUI. This will have 3 tabs, corresponding to the three images loaded. Select the total intensity tab (3c391_ctm_spw0.I). 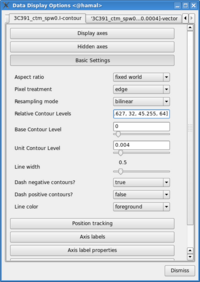 Change the relative contour levels from the default levels of [0.2,0.4,0.6,0.8,1.0] to powers of , including a couple of negative contours at the beginning to demonstrate the image quality. An appropriate set of levels might be [-1.414,-1,1,1.414,2,2.828,4,5.657,8,11.314,16,22.627,32,45.255,64]. These levels will multiply the Unit Contour Level, which we set at some multiple of the rms noise in the total intensity image. An appropriate value might be 0.0024 Jy ( ). Change the vector spacing and color, and rotate the vectors. The polarization position angle as calculated is the electric vector position angle (EVPA). If we are interested in the orientation of the magnetic field, then for an optically thin source, the magnetic field orientation is perpendicular to the EVPA, so we must rotate the vectors by . Select the vector image tab in the 'Data Display Options' GUI (labeled as the LEL expression we entered in the Load Data GUI) and enter 90 in the Extra rotation box. If the vectors appear too densely packed on the image, change the spacing of the vectors by setting X-increment and Y-increment to a larger value (8 might be appropriate here). Finally, to be able to distinguish the vectors from the total intensity contours, change the color of the vectors by selecting a different Line color (red might be a good choice). The following example begins with the standard data set, 3c391_ctm_mosaic_spw0.ms, resulting from the 3C391 Continuum Tutorial. A model I-only image is generated (3c391_ctm_spw0_I.image), this model is used to generate a series of gain corrections (stored in 3C391_ctm_mosaic_spw0.G2), those gain corrections are applied to the data to form a set of self-calibrated data, and new image is then formed (3c391_ctm_spw0_IQUV_G2.image). Note that in the clean before the self-cal, we only image I so that any cleaned polarization does not affect the gaincal. Bookkeeping is important! Suppose one conducts 9 iterations of self-calibration. Will it be possible to remember one month later (or maybe even one week later!) which set of gain corrections and images are which? In the example above, the descriptor 'G2' is attached to various files to help keep straight which is what. 'G2' is used because the original calibration already included a gain calibration, in 'G1'. Successive iterations of self-cal could then be 'G3', 'G4', etc. Care is required in the setting of imagename. If one has an image that already exists, CASA will continue CLEANing it, which is almost certainly not what one wants during self-calibration. Rather one wants a unique imagename for each pass of self-calibration.